The Flathead V8’s, based out of the Flathead Valley, will take the stage at 6pm to kick off the evening. Having formed in 2016, the V8’s have taken the local music scene by storm, bringing their high octane brand of rock and roll to stages all over Montana. Following the V8’s will be American Rock Band Dead Fervor. This band wants to put rock back on TOP! By combining some of the best musicians in their region its clear that's exactly the direction Dead Fervor is heading! The guys in Dead Fervor have shared the stage with legends such as: Cinderella, Tesla, Daughtry and Quiet Riot. 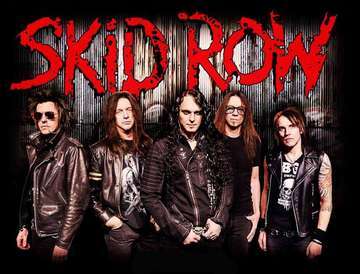 SKID ROW--The first rebellion started in 1986. New Jersey kids, pink and metal attitude, determined to conquer the world. All for one, banded together with single-minded purpose. The battle field was the stage, the songs their arsenal in an us-against-them musical coup d’etat. Soon followed top ten singles, gold and multi-platinum sales along with being No. 1 album on the Billboard Chart. The world was theirs, the rebellion won, until there was nothing left to fight for…so they fought each other. Following an ill-advised South American tour in 1996, the band was finished. But that core camaraderie never died. Snake Sabo, Scotti Hill and Rachel Bolan vowed that SKID ROW would NOT fade into rock and roll obscurity. WAIT the party doesn’t stop there! Devon Wade, who will round out the night, is an independent country music artist out of Sandpoint Idaho with a strong love for what country music has always been, songs about real life and things that matter most in life.